On tabs «Run before» and «Run after» you can define external applications to run before and after archiving. On these tabs you can specify the command line, parameters and working directory for external application. You can also define timeout interval in milliseconds. In this case, APBackUp will wait until either the execution is finished or the timeout interval is elapsed. 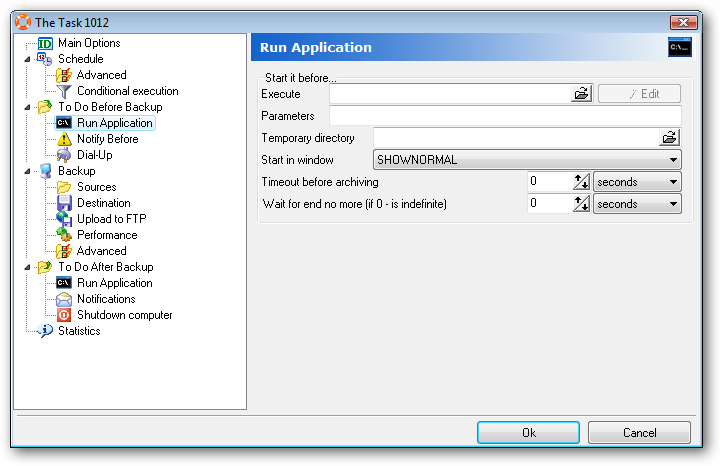 You can set timeout to 0, if you don't want APBackUp to wait for the external application to complete. You can set timeout after executing external application before starting archive task or after archiving before starting external application. For example, you can send a message to all users asking them to exit the application that locked source files and then wait 5 minutes before starting backup to allow users to exit the application. · [Source] - source folders. Example: If you enter the command "WinZip [ZipName]" in "Run After", then, after archiving is finished, the created archive will be opened in WinZip.